I thought I had done everything right. I thought I was playing it safe. I had never expected this to happen. Not to me at least. The day before on a booze cruise on the Zambezi River near Victoria Falls in Zimbabwe a Swedish guy asked me if I ever felt scared traveling solo. A question I have been asked many times. I was more than halfway through a 24 day trip through Southern Africa visiting South Africa, Botswana, Namibia, Zimbabwe and Zambia. Working with a PR company hopping from one luxury lodge, to luxury hotel, to luxury houseboat and so on. This was technically my 6th border crossing of the trip and up until now everything had gone amazingly smooth. 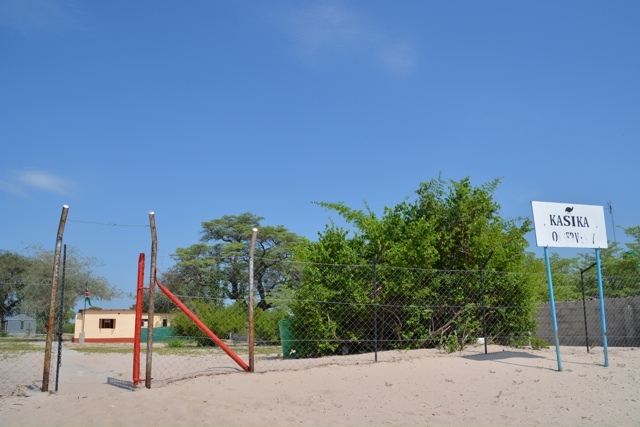 A Namibia border point. One of the many border controls I encountered with out trouble on my trip. I had transfers previously arranged through the properties to get me from point A to B. At each border crossing one driver would take me to the border, wait for me to get my stamps or VISAs and then literally hand me off to the next driver in the next country. I was surprised at how seamless everything had gone. The day before I was to go from Zimbabwe to Zambia the hotel I was staying at kept asking me about my transfer the next day. I told them yes I was going to Zambia and yes they were to arrange the transfer. They even told me they would call the next property to confirm everything was in place for a smooth transition. The morning I was set to leave they confirmed it with me again, and asked if I had called the next hotel. I was confused, as they had volunteered to do this for me themselves and of course at this exact moment I had to jump in my transfer to leave as we were already running late. I had no time to call and confirm. However everything had worked without a problem up until now so I figured it would be fine. 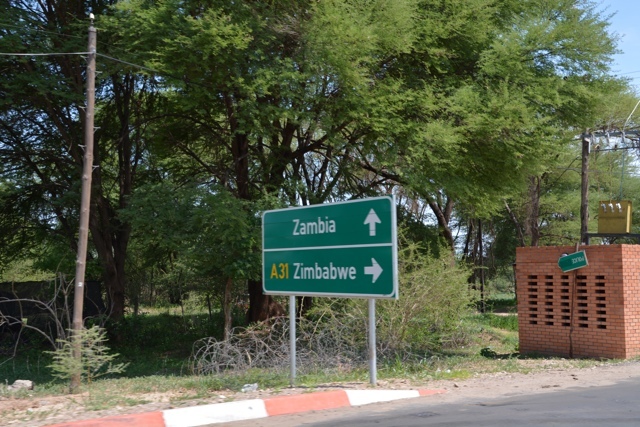 We drive the 10 or 15 minute drive to the Zambian border from my hotel. The driver comes with me to look for my next driver as I stand in line for my VISA. Once I’m finished he finds me again and tells me he sees no one there to pick me up. I think that this is odd, but I note the time and see we were 20 minutes late. The driver doesn’t want to leave me there alone at the border but he can’t cross over to the other side either to help me look for my new driver. He waits for me while I walk to the Zambian side carrying my suitcase and dodging wild and fierce baboons in search of my next transfer. There is no one waiting for me. I start to get a little bit worried. My driver starts to get a bit antsy as he needs to leave to pick someone else up. I pay him a ridiculous amount of money for the short drive to the border and he leaves me in the hands of a border guard who attempts to help me. I’m in border limbo, straddling the line between where Zimbabwe ends and Zambia begins. After paying the guard $2US to put credit on her phone she calls the number that I have for the next hotel multiple times but it doesn’t work. I tell her and some other border guards the name of my next hotel and they have never heard of it. I don’t have a sim card for my phone and my KeepGo mifi can’t pick up a signal (if only I had brought the antennae for it with me). I am at a loss of what to do and I start freaking out a little bit. As a last resort I attempt to take my phone off of airplane mode to use my Canadian SIM to try to use the internet to find another number for the hotel. NO SERVICE glares back at me from the top left hand corner of the screen. At this point I have the female guard, a male guard with machine gun in hand and some kind of border manager guy trying to help me figure this out. They suggest I take a taxi to the post office in town to find the correct number and address for my hotel. “Do the Taxis take $US?” I ask? Having just left Zimbabwe where that is the main currency, it is all I currently have on me. Of course in Zambia no they don’t take $US. They only take Kwacha and I quickly learn (after dragging my suitcase to the machine past the baboons and back) that the only debit machine at the border won’t work with my card. I contemplate rolling up in a ball and crying as I gently rock myself back and forth. I do realize this won’t help me get anywhere. Perhaps if I were traveling with someone else this wouldn’t be such a scary situation. We could work through the situation together, comfort each other, figure something out. I thought I had done everything right. I had the name and phone number of the lodge, I was traveling during daytime, and there should have been someone here to pick me up. I thought I had had the address but my itinerary just says “Luskaka” which I later learned was more than 6 hours away from the border and not anywhere near my lodge. 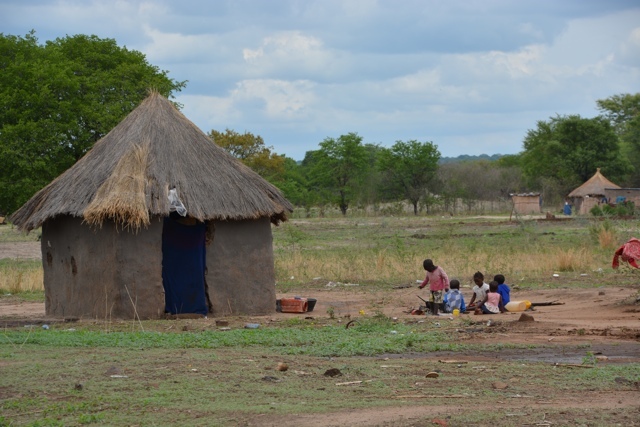 I was stuck at the Zambian border with no cell service, with wild baboons running around me, not being allowed back into Zimbabwe, with no drive, carrying the wrong currency, being talked to by a guy with a machine gun, without the proper address of my lodge and not a single person I talked to had heard of my lodge before. I guess you can only prepare for so much. I was beyond lucky that this was happening to me in a country where english was spoken, so at the very least it was easy for me to communicate with others. I can’t even imagine what this might of been like otherwise. The three people now with me at the border kept trying to think of solutions and were being so nice. Finally the two men suggest that they can drive me to another bank machine then put me in a cab to go to the post office in the city to find the correct information for my hotel. I reluctantly get into a car with them. At this point I don’t know what else to do. I couldn’t decide if the fact that one of them was carrying a machine gun was a good thing for my safety at this point or a bad thing. We get to the bank and I hop out leaving my bags with them. I get some cash quick and notice my phone is picking up a wifi signal. I try to log onto it with no luck. They tell me I need to hurry as they need to get back to doing their jobs. I try another signal and still no connection. I give up. They drop me off at a taxi stand and hand me over to a taxi driver that they seem to know and trust. I was waiting for them to put out their hands and ask for money or not let me take my bags. But none of that happened, they just really wanted to help. I was so thankful for them I wish I had gotten their names or at the very least a photo. 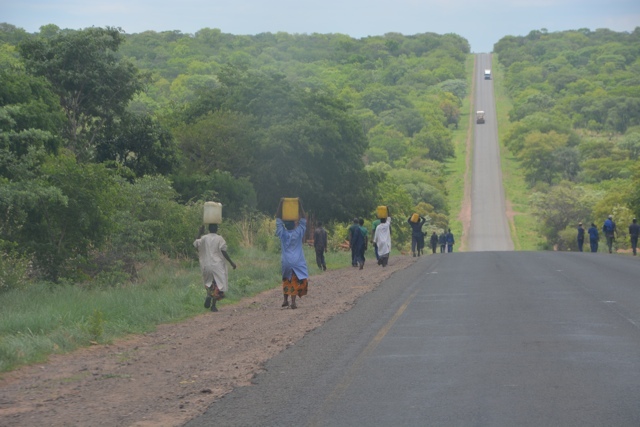 The Zambian Highway to my hotel from the border. As I drove away in the taxi we began negotiating a price to the post office. He then asked me the name of my hotel and said he knew where it was! This made me feel a bit better better but it was still 60 or 70kms away from where we were. I asked how much it would be for him to take me there and we eventually agreed on a price that I knew might be too much but at this point if it got me there in one piece I didn’t care. We stop for gas and he fills it up with less than 50 Kwacha, which is less than $10. Just like their cell phones having no credit they don’t seem to keep their cars full of gas either. We start driving and I catch myself nodding off to sleep in the back seat. We drive for what seems like forever, through the city then down a two lane highway with check points along the way and people driving like crazy. We pass villages and signs for other lodges and hotels. I wake up and we have turned onto a dirt road. I missed seeing a sign and start praying that we were still headed to the right place. Ideas rushed through my head of what else could happen and none of them ended pretty. About 1km down the road I see a sign with the name of the property and breathe a big sigh of relief. I finally arrive. Four hours after I should have arrived. I’m not sure if I was more relieved to have finally gotten there or that they were more relieved to see me alive and in one piece. At the lodge I finally get wifi and my phone blows up with urgent text messages and emails from the lodge and PR company trying to find me. I later learn that the first hotel sent me to the wrong border and that the other lodge had been waiting for me that whole time freaking out at another border two hours away with no idea where I was. I was almost just as happy that they didn’t contact my parents and tell them they can’t find me. That would not of been good. This was by far one of my scariest moments when traveling solo. I had to make some choices that I told myself I would never do, like getting into a car with strangers… especially one with a machine gun. But I’m glad it worked out and I have survived to tell my tale. Do you have any scary solo travel experiences? Share them in the comments below. This sounds scary! Glad it worked out okay :). I travelled alone in Ghana but I hadn’t planned anything and was just winging it -I ended up staying with a local family one night after I arrived in a new place at night time with no plans of anywhere to stay. Thankfully they were so lovely! That does sound scary. If you were with somebody else you could probably reassure each other but its hard when you are on your own. I did get refused at the border between Rwanda and Uganda but after much smoozing and waiting (and eating mangos in no mans land) we eventually got through. We couldnt go back or go forward but as there were 3 of us with just thought it was funny. I would have been a lot more worried if I was on my own. Not to belittle the situation, but I would have been most freaked out by the monkeys…or at the very least they would be the factor to put me over the edge as I seem to get anxiety around monkeys, is that weird? Glad everything work out! Wow! I have traveled solo before too. never had anything like this happen. Then again I haven’t been to Africa yet. Glad everything worked out for you. I dunno whether I’d go to south Africa alone or not.. :S heard lots of good things, and bad things. Thanks for posting! South Africa and Southern Africa in general can definitely be done safely as a solo traveler you just need to plan ahead and make smart choices :) And this story didn’t happen in South Africa it was on the Zimbabwe and Zambia border. I’ve recently found many great places I’d love to visit. However, I don’t think my husband will be willing to go to some. It’s scary to think of going by yourself, but it’s nice to hear about your experience. I agree with the others, you are indeed very brave! I still think you’re brave. I wouldn’t know where to begin with South Africa… it’s so out of my element. I keep putting it off. I feel like travel surprises you even when you think you’re prepared or experienced. 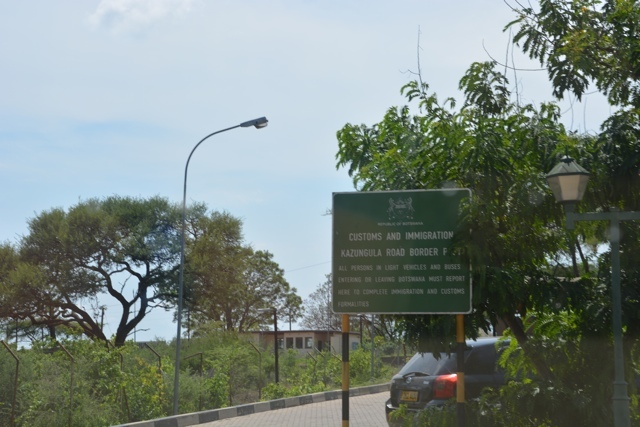 It’s almost like it’s there to tell you – one more lesson, one more… Border crossings always make me feel edgy because I know scams can occasionally happen there too. Glad things worked out. Hey Christine, I think it helped that this was my second time there and the first time I went I was there with a small group. I highly recommend you visit at some point. 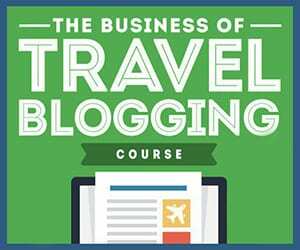 Let me know if you have any questions about what to see and where to stay. Haha well mistakes DO happen. Life would be quite boring if they never did! Glad it all worked out in the end. 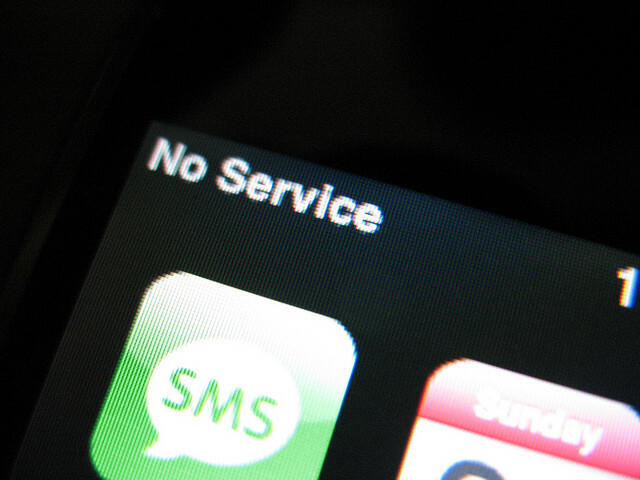 It always does… (And this is a great example why local SIM cards can be quite useful). A few years ago I was trying to get from Sinai in Egypt to Petra in Jordan on the same day and I was too cheap to take the overpriced ferry that bypasses Israel. I got to the bus station way early and was so sure I’d miss the connecting bus in Jordan if I took the bus to the Egypt/Israeli border that I accepted an offer to pay a guy to drive me halfway. Turns out it was just him and I in his pickup truck (something he had lied about) and we arrived at a police checkpoint and he offers up a book of fingerprints (!) and a bribe. When we get to the halfway point, he tells me he has a friend who is going to the border who will take me for a price. We negotiate a bit and I agree. I get in the next pickup truck and the guy suddenly does a U-Turn and veers off the road. Several kids start flinging rubber tires into the back of the truck with my bag and hop in. We start going the right direction again and suddenly the kids jump out and form a road block behind us with the rubber tires and then light them on fire! My driver floors it and drives off, eventually passing me off to some van that belonged to a resort. After getting stuck at that resort for 45 minutes, I finally, after much begging and pleading, made it to the Israeli border. And after all that, I still missed the last bus to Petra from Aqaba! This sounds horrific. I’m glad everything worked out okay though. It sounds like you did the best that you could given the situation that you were in. That is really scary, but I’m glad it worked out for you. Luckily I’ve never gotten into anything even half as scary as that. Under the circumstances I don’t think you could have done anything differently. You were lucky the border guards helped so much, as I don’t know what you could have done otherwise. But it’s good to know that there are some really nice and helpful people out there. Glad you made it through your adventure, sounds a touch freaky! So glad you made it alright! That would definitely be scary solo! Glad it worked out. I was in Zambia and Zimbabwe traveling solo and had a very detailed itinerary w/boarder handoffs from one driver to the next for my one month visit (no PR folks looking for me – just my mom texting to check in) What freaked me out is that after leaving Botswana i had no mobile coverage until i got to South Africa. The lodge did have wi-fi so I was able to email to confirm. Next time I will buy local phone. I found that the drivers and guards were all so nice and helpful to make sure it went smoothly – I was impressed with this as it was done for all passengers. Wow! At least the hotel and the pr company were trying to find you. Many times I travel alone, alone. I don’t even leave an itinerary with my family, so I like the idea of them looking for you. And very cool that the guards didn’t try to extort money from you and actually helped you… a few times I have been ripped off and i usually know it and it pisses me off! But this was a scary situation for sure. Glad you made it. Scary story.. I know exactly how you feel. As you know, I travel by myself quite often as well. I find myself in situations where it seems like you put your entire life into the hands of someone else, of whom you have never met, hoping they are sincere in their efforts to help you. I am 6′ 2″ man and am sometimes nervous in these situations, I could only imagine how you felt. I just got back from Brasil, which although has many friendly people, has its share of questionable people as well. Add to that, not many people speak English or Spanish but Portuguese, it makes traveling a million times harder. At the end of the day, although all the situations end up being nothing but my nerves and thoughts worrying me, having another person there with you makes a world of difference. I’ve always admired your courage and passion for traveling. Hope to bump into you again in our travels. I was in a similar situation just ten days ago in Romania thanks to a cancelled flight and the holidays. I was so thankful to be an experienced traveler who knew how to keep her head straight when things went awry. Glad everything worked out! YIKES! You are so lucky that you came across nice border guards who wanted to help you instead of extort you. Glad it all worked out in the end! Ya it all could of definitely been a lot worse. So lucky! Oh dear! This is Africa! Glad you were ok! Where were you heading for, Livingstone? Or Lusaka? I think I’ve done about 13 border crossings in Africa, but never had anything scary happen. A few random things have happened though. But I always find that African people are generally soooo helpful. I once hitched a ride with a local mini bus (organised by the bar man of the camp I was staying at) as the trip I was on was 4 days, and I had a flight to catch in 3, I was in Zambia and I needed to get back to Malawi. So the mini bus drops me near to the border, points me to a taxi, I get in and I have someone sat on my knee, I’m sat on another persons knee – there were 7 of us in there I think… we only drove a short way (slowly). My bag is in the (open) boot as we’re driving along, I’m wondering if it will still be there when I reach the border. Then they drop me off. Passport stamped, over I go – then the same scenario on the otherside in reverse. I get on a mini bus and off we go. Back in Malawi we got stopped at every check point and the guards were very interested in what this English chick was doing alone on a public bus! But it was fine. I loved it! Helen your story sounds crazy too! The people were unbelievably helpful and nice and I found so many people that I encountered there were as well.